Pictured from left are Ashlynn Blecher, Rachel Albertson, Whitney Church, Olivia Tocash, Raven Tilford, and Christina Rose. SPARTA — Highland’s 57th annual homecoming will be held on Friday, Oct. 5. The ceremony will begin at 6:25 p.m. prior to the football game against Fredericktown. The court will be escorted by the senior football players and their fathers. The queen will be crowned at this time. 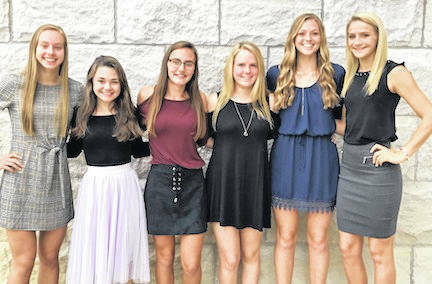 The 2018 Highland Homecoming Court consists of freshman attendant, Ms. Ashlynn Belcher; sophomore attendant, Ms. Rachel Albertson; junior attendant, Whitney Church and the three senior attendants, Ms. Christina Rose, Ms. Raven Tilford and Ms. Olivia Tocash. The court has picked Sophia Scaffidi as the mascot and she will present the necklace to the new queen. Highland will be having dress up “spirit days” during Homecoming week to build excitement for the ceremony. The school will also host a powder puff game and bonfire to be held as a Community pep rally. The pep rally will commence on Wednesday, October 3rd at the football stadium starting at 7 p.m. All are welcome. Frank Darst, Hamburg Fireworks Display Inc., will be providing fireworks for every Highland touchdown and as always he will give an amazing display after the game. The traditional homecoming dance will be held on Saturday, Oct. 6.